Right-hander out of College of Charleston is first pick in third round. MISSOULA, MONT. 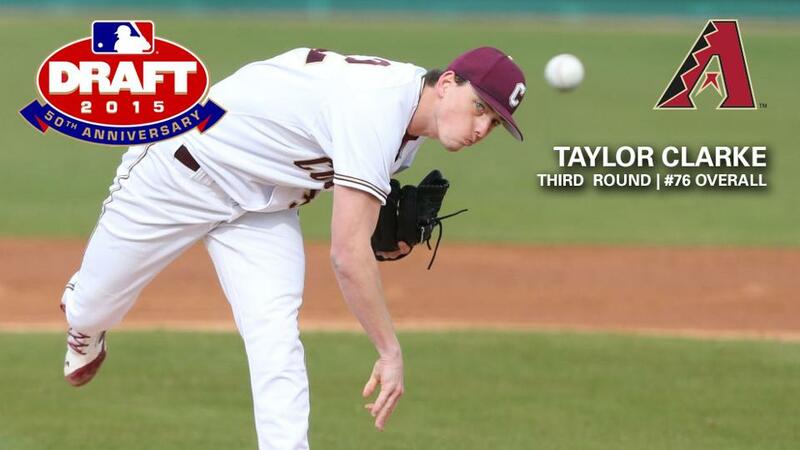 - Day two of the 2015 Major League Baseball First-Year Player Draft began on Tuesday with the Arizona Diamondbacks selecting right-hander Taylor Clarke out of College of Charleston. The third through 10th rounds will be selected today. Arizona, which selected a pair of standout college players in Dansby Swanson (1st Rd., #1 overall, SS, Vanderbilit) and Alex Young (2nd Rd., #43 overall, LHP, TCU) in the first two rounds yesterday, added to the pitching depth with Clarke. While Clarke began his collegiate career at Towson University, making 10 appearances in 2012, he elected to transfer to College of Charleston after Towson announced plans to drop baseball in 2013. Following successful Tommy John surgery in his sophomore season, Clarke has emerged as one of the best pitchers in college baseball the last two years as a Cougar. After registering the CAA's fourth-best ERA (2.51) and a 10-4 record over 18 appearances in 2014 en route to being named a semifinalist for the Gregg Olson Breakout Award, the #118 prospect according to Baseball America went 13-1 with a 1.73 ERA and two complete games over 17 appearances and 16 starts in his redshirt-junior season in 2015. Clarke, who works at 92-96 mph, tossed 114.1 innings, striking out 143 and walking only 14 while limiting opponents to a .185 batting average against. His 13 victories rank tied for first in the nation, while he is currently third in the country in strikeouts. According to Baseball America, the 2015 All-American selection "has developed above-average command of his potent three-pitch arsenal, with the ability to pitch off of his fastball. His slider is his best secondary, thrown with power in the upper 80s and glove-side cut. Clarke has exceptional command of both pitches, with the ability to pound his slider to the back foot of lefties, punch it through the front door of righties, or compete at the heart of the strike zone." Clarke's 6'4" 195-pound frame projects well, and his overhand delivery provides deception and downhill plane, but scouts see the development of his changeup as the key to eventually earning a spot in a big league rotation.